Central to ISEA2013 is a thought-provoking program of artists’ presentations, creative dialogues and critical debates that will unearth the latest thinking and ideas in contemporary culture. The 3-day ISEA2013 Conference will feature over 220 speakers, 8 keynote addresses from global leaders in the fields of art, science, technology, media and communications. Topics will explore a range of cultural forms including bio-art, data visualisation, robotics, augmented realities and urban and virtual ecologies. The conference will be held from Tuesday 11 to Thursday 13 June at The University of Sydney. 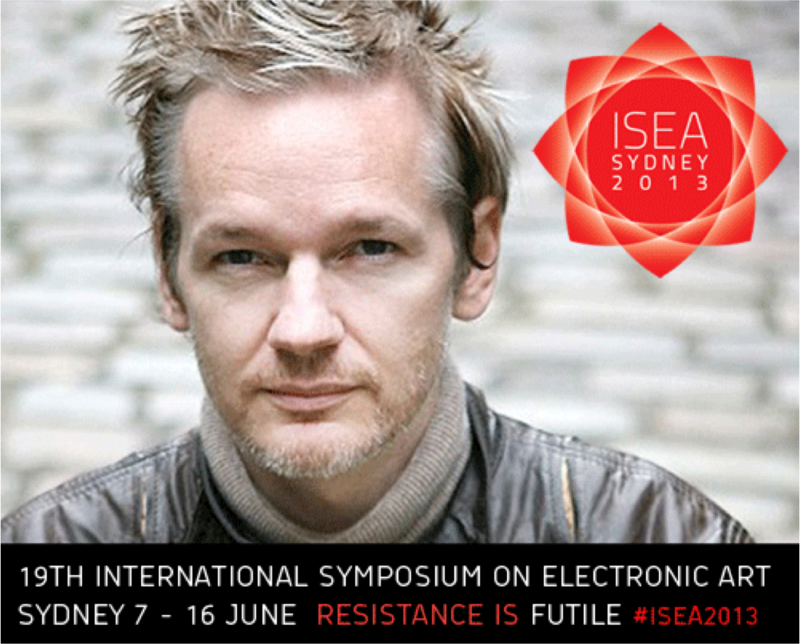 Special guest Julian Assange will present a Keynote speech at the ISEA2103 Conference at the University of Sydney on Thursday 13 June 2013 at 5.30pm. The WikiLeaks founder will address the conference via live video link from the Ecuadorian Embassy in London. The Opening Keynote will be given by New York based Michael Naimark, renowned pioneer media artist and guest curator of the 25th Anniversary Ars Electronica. Professor Brian Rogers will discuss “Perception, Art and Illusion” in his conference keynote address. The ISEA2013 Talks Program in collaboration with Vivid Ideas will inspire new thinking and creative paradigms through provocative speakers such as Italian media critics and hacktivists Alessandro Ludovico and Paolo Cirio, whose infamous online project Face to Facebook involved stealing 1 million Facebook profiles, filtering them with face-recognition software, and posting them on a custom-made dating website. Mark Hosler of Negativland will be giving a storytelling and film presentation titled, Adventures In Illegal Art: Creative Media Resistance, Negativland, and the Fight To Not Be Absorbed”, Stelarc will present “Meat, Metal & Code: Engineering Aliveness & Affect” as well as a keynote presentation from Genevieve Bell, Intel Fellow. ISEA2013 is proud to present a series of artist panel talks at the MCA as part of our collaboration with Vivid Ideas. We have selected artists from the ISEA2013 and Vivid exhibition programs to come together on a range key thematic topics to discuss the role artists play in creatively investigating the possibilities and pushing the limits of new (and old) technologies. Join us to see how artworks help us to imaginatively experience and critically reflect on the role technologies are set to play in life, art, culture and communication in the 21st century. Also released are a number of workshops where you have the opportunity to get hands on and play with new techniques and technologies. These are available for booking through the registration system, but all of these events have limited numbers and most are free to ISEA2013 registered delegates, some of these are available to non-delegates so look at what’s on offer and book your places now! If you have already registered, please revisit your registration and add events to your agenda, all you need is your registration reference number. The ISEA2013 Exhibition and Performance Programs will showcase the works of over 200 innovative Australian and International artists at some of Sydney’s key cultural institutions; the Powerhouse Museum, the Museum of Contemporary Art, The Rocks Pop-Up, Carriageworks, the College of Fine Arts UNSW, COFA’s Kudos Gallery, 107 Projects, Tin Sheds Gallery, Verge Gallery, Studio 22 – ABC Ultimo, UTS Gallery and DAB LAB, Artspace, and Campbelltown Arts Centre. Also, project hubs at Parramatta and at Chatswood will link Darwin, the Tasmanian Wilderness and Indonesia to Sydney.